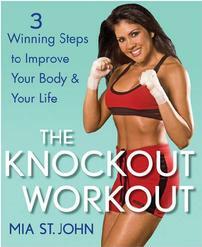 Mia St. John is a 5-time World and International Boxing Champion and first generation Mexican born in America. She founded the "El Saber Es Poder" Foundation to empower individuals suffering from mental illness, homelessness, addiction and poverty by providing programs to better educate, inform and improve physical and mental health. Mia St. John was born in San Francisco, California. Her fighting career started soon after, at the age of six, competing in Tae Kwon Do. Mia earned a black belt and received a Bachelors Degree in Psychology from California State University of Northridge in June 1994. Mia made her pro-debut in boxing in 1997 after signing a lucrative contract with world famous promoter Don King. After accumulating an unheard of boxing record of nearly 70 pro fights and five world and international titles, in 2017 Mia retired. Mia is always media savvy. She has made appearances on such shows as, Jay Leno, Conan O'Brien, "Good Morning America," "Entertainment Tonight," "CNN," “Fox News," "E," and countless others. She has also acted in commercials and played herself on t. v. shows and has her own Playstation game by EA sports. She has written articles on mental health, fitness, overcoming hardships and female empowerment for the Washington Post, Huffington Post and many others, along with a book, "The Knockout Workout", which sold in stores nationwide. Public speaking being one of her many strong points, she was asked to speak at the Congressional Hispanic Caucus, where President Barack Obama made a riveting speech at the CHCI's annual Gala. She continues to speak at Universities, High Schools and Congress about overcoming obstacles, such as poverty and addiction. On November 23, 2014 Mia's son Julian, passed away at the age of 24. He was a talented artist battling Schizophrenia and addiction. His art was displayed at the Laguna Gallery of Contemporary Art and Air Laguna in Laguna Beach, California. His personal art studio, "Stone Art" is now a free center for young adults suffering from mental illness, including homelessness and addiction. St. John says of her son, "He was the light of my life and I will continue to fight for mental health until I take my very last breath". Mia was named by CNN, "Mental Health Warrior", along with eight other inspiring people. She is currently working on a film about the failure of our mental health system, exposing the negligence of government funded programs and facilities in Los Angeles County.